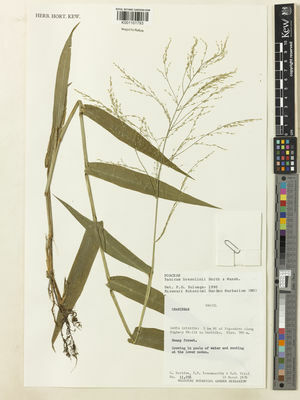 Panicum bresolinii L.B.Sm. & Wassh. This species is accepted, and its native range is S. Brazil. Perennial. Culms decumbent; robust; 85-100 cm long; rooting from lower nodes. Culm-internodes distally glabrous. Culm-nodes bearded. Leaf-sheaths keeled; hirsute; with tubercle-based hairs; outer margin hairy. Leaf-sheath oral hairs bearded. Ligule a ciliolate membrane. Leaf-blade base cordate. Leaf-blades linear, or lanceolate; 13-26 cm long; 20-30 mm wide. Leaf-blade midrib prominent beneath. Leaf-blade surface hirsute; hairy on both sides; with tubercle-based hairs. Leaf-blade margins crenate; scabrous. Leaf-blade apex attenuate. Inflorescence a panicle. Panicle open; pyramidal; effuse; 15-30 cm long; contracted about secondary branches. Primary panicle branches ascending; 1-3 -nate. Panicle branches secund. Spikelets solitary. Fertile spikelets pedicelled. Pedicels 2-3 length of fertile spikelet; scabrous. Spikelets comprising 1 basal sterile florets; 1 fertile florets; without rhachilla extension. Spikelets lanceolate; dorsally compressed; acute; 1.5-2 mm long; falling entire. Glumes reaching apex of florets; thinner than fertile lemma. Lower glume ovate; 0.5 length of spikelet; membranous; without keels; 3 -veined. Lower glume primary vein scabrous. Lower glume apex acute. 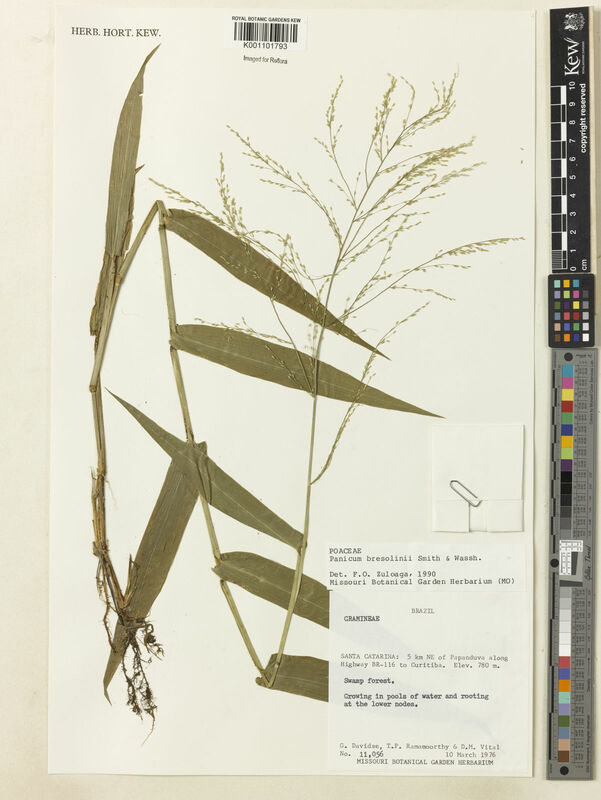 Upper glume ovate; 1 length of spikelet; membranous; without keels; 5 -veined. Upper glume primary vein scabrous. Upper glume apex acute. Basal sterile florets barren; without significant palea. Lemma of lower sterile floret similar to upper glume; ovate; 1 length of spikelet; membranous; 5 -veined; acute. Fertile lemma elliptic; dorsally compressed; 1.2-1.7 mm long; indurate; without keel. Lemma margins involute. Palea involute; indurate.